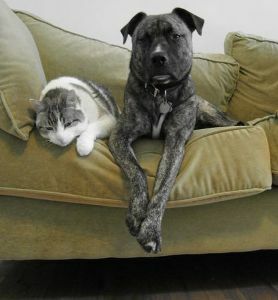 Most of the time dogs share their homes with other pets, like cats and other dogs. 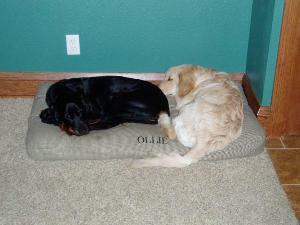 Most of the time dogs and other pets can live together happily. But, you never know what can create a dispute over territory. When introducing a dog to a new animal, keep them separated for a few days. This way the dog will be able to smell the new animal for a few days. After a few days, the dog will not feel stress of confronting of new smell with this new animal. Dogs can also be a victim to predators. In areas where both dogs and other large predators live, dogs can become a food source for big cats or other canines. Dogs and humans have a mutualistic relationship. Humans provide food, shelter, safety and the ability to reproduce. Dogs provide companionship, safety, and help with certain jobs. Guide dogs, commonly called seeing eye dogs, are paired with blind individuals to help them move around safely. 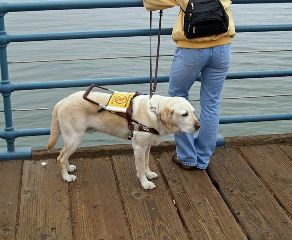 Most seeing eye dog schools train Golden Retrievers, Labradors, and German Shepherds because they have the best temperament for this type of work. Dogs are also trained for the police and airport security. 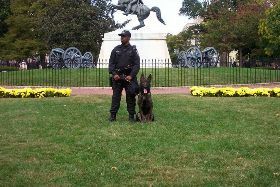 Police dogs, or K9 Units, are trained to locate drugs and suspects. They can also be used to chase down suspects and restrain them. K9's are given the same protection as police and wear bullet proof vests. Dogs are also used on search and rescue teams. These dogs are trained to search and find people who may be trapped due to a fire, earthquakes, avalanches, or other natural disasters. Dogs also serve the purpose of everyday activities for some humans. They are often used to herd sheep, pull sleds through snow, and guard properties. To learn some fun facts, click here.